Heavens, it seems like just yesterday that Jacques-Laurent Agasse and Josef Albers stepped into the ring and, with no fanfare whatsoever, began the first match of the First Round of the so-called “Infinite Art Tournament.” Can you believe that we’re already one-quarter done? But we are! In a limited sense! To celebrate the day, there are two very modest new features. One is a full and occasionally coherent statement of the tournament rules, which I prepared as an exercise in technical writing. (Finding: Technical writing is harder than it looks.) 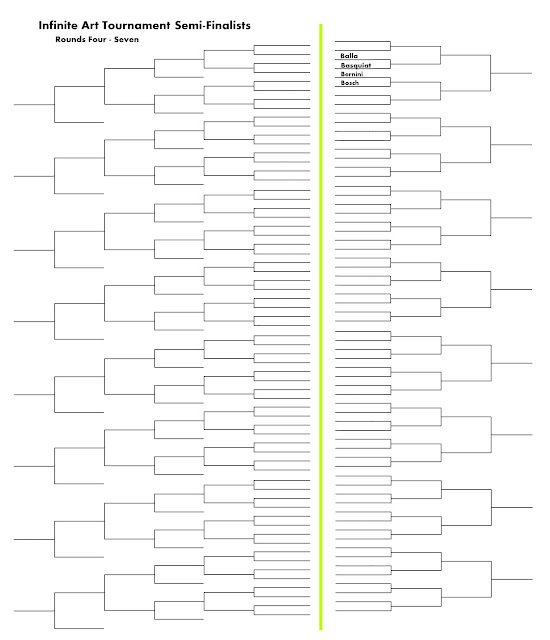 The second is the entire third bracket sheet, available over there in the sidebar. From Dubuffet to Hals, you can look up your favorite late-early alphabet artists to check whether they’re in the show and scope out their First-Round competition. Yow! By the way, if you are feeling a melancholy sense of the party being over before it is fairly begun, remember that we’re only talking about the First Round here. This is what the semi-finals bracket – Rounds 4 through 7 – looks like so far. To the extent that we have a leader, so far it would probably be Bernini. He’s one of four artists who have made it to the Fourth Round, and with a running total of 33 votes for and only 15 votes against, he is clearly a crowd favorite. On the whole, we’ve had more close matches than routs, and no one has yet been skunked, but Cornell’s 13-1 pasting of Copley and Bernini’s 15-2 romp over Beuys couldn’t have been pleasant for fans of the losing artists. Beuys is the least fortunate artist in the early going. Despite not arousing any particular hostility in the crowd, neither did he inspire many votes, and he retired with a painful total of 4 for and 24 against. Leading the pack so far is Remedios Varo, with a batting average of .917 in her flight. Again, we’ve yet to see anyone fail to get any votes at all, but Anselme Boix-Vives and Anges Martin share a painfully low score of .067. Advanced metrics are the rage in sports today. I see no reason why they couldn't be applied here. You've already alluded to keeping track of voting percentage. But why not take it up a level? How about calculating strength of schedule to really assess how well an artist has done? I've been finding myself wondering, what do these tournament results say about art taste in general? Are certain countries of origins doing better (I feel possibly France is doing the best while Germany is struggling)? Are certain art eras more likable (Impressionism over Renaissance over modern?) than others? How about under-represented groups? Is the female win percentage high enough to warrant a reassessment of their numbers? What about countries outside Europe and America? Jenners: Plenty, but not as much as you might think. I work fast. You should see me at the office. Chuck: Don't think I haven't thought about these things.